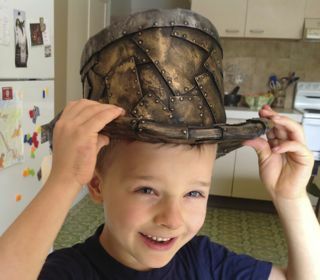 I have finally finished my video tutorial on how to make a steampunk top hat! You can buy the pattern in my shop if you like it. Check Out My Pattern Shop! This hat is a revision of my cardboard steampunk top hat, being that the cardboard hat was too uncomfortable to wear for any length of time and fit only a very specific head shape. I decided to try foam as the material of choice for this project- light, flexible, water resistant, and cheap. The basic construction is made from a camping or exercise mat, with the overlapping plates being readily available craft foam. The thing I like about this construction is that once you have the pattern, it only takes about 10 minutes to cut the three parts and glue them all together to form the basic top hat, from there you can choose how you want to cover it or dress it up etc. I made one that fit my son and he wore it all day long, at home and out at the park, which I think is the best comfortability test, as he is not prone to leave his hat on longer than necessary! If anyone makes this top hat, email me pictures and I'll post them for others to see!